L. Rubin, Frank Stella: Paintings 1958-1965, Catalogue Raisonné, p. 64, no. 32 (illustrated in color, p. 65). Oberlin, OH, Allen Memorial Art Museum, Oberlin College, Three Young Americans, May 1959. Malden, MA, Malden Public Library, Frank Stella, June 1959. Ottawa, National Gallery of Canada, Group Exhibition of American Art, July-September 1968 (and then on extended loan, 1968-1971). Toronto, David Mirvish Gallery, Works from 1960-1963, November 1971-January 1972. Ottawa, National Gallery of Canada, Group Exhibition of American Painting, May-July 1975. Toronto, David Mirvish Gallery, Frank Stella: An Historical Selection, 1976. 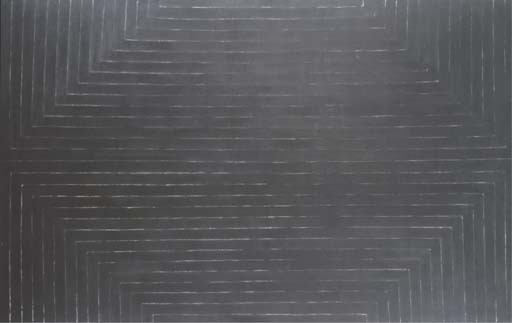 Baltimore Museum of Art, Frank Stella: The Black Paintings, 1976, p. 30 (illustrated, p. 31). Bordeaux, Musée d'Art Contemporain, Peintures: emblemes et references, December 1993-February 1994 (remained on extended loan, March 1994-September 1995). Madrid, Museo Nacional Reina Sophia and Munich, Haus der Kunst, Frank Stella, September 1995-April 1996, n.p. (illustrated in color). Ottawa, National Gallery of Canada, Frank Stella, May 1996-June 1997. "One constant, at least, of this decade is the importance of the Black Paintings as epochal art history; for now, like then, they retain the watershed quality so apparent when they were first seen in 1959. Today too they have the character of a willful, and one might add, successful manifesto that would wipe out the past of art and that would establish the foundation stones for a new kind of art that, as it turned it out, was not only Stella's own but the core of a group style of the early 1960s to be labeled Minimalism" (L. Rubin, Frank Stella Paintings: 1958-1965, Catalogue Raisonné, New York, p. 10). Stella, a young artist, recently graduated, had worked as a housepainter and used some of the same materials and techniques in his Black Paintings. They were painted in household enamel using flat wide brushes to create the regular thick banding with minimal gesture. The action is both restrained and straightforward. The Black Paintings were made in two series, the larger one being based on rectilinear diagrams that Stella developed as small drawings. Because of the dramatic difference between these and other paintings being made at the end of the American Expressionist decade, the first series is regarded as the more important. It is made of rectilinear patterned pictures such as Bethlehem's Hospital; Richardson has shown that the works have related structures and forms, with the image in one work becoming another's subject by addition, turning or repetition. She notes that Club Onyx turned 90 degrees gives the format of Bethlehem's Hospital. The notes for the drawings are in the catalogue of the Baltimore Museum exhibition of 1976 and one can clearly see the development of the thought process and the refinement of his ideas. Stella responded to the dramatic gestural painting of the Abstract Expressionists, and parallel to the efforts of Johns and Rauschenberg of these years, searched for a way to incorporate his responses to the world outside art in his works. Where Johns and Rauschenberg used objects and recreated symbols such as the flag or a bed, Stella used a simple repetitive gesture in monochrome and referred to the world through his titles. These have political or social significance recalling episodes ranging from American blue-collar struggles to racial discrimination, including Nazi atrocities in Europe during the Second World War to societal institutions. Bethlehem's Hospital refers to the famous London "hospital," or insane asylum, known as Bedlam. The works were conceived as a series of sketches and drawings and their titles prepared collaboratively with Carl Andre and others. The friendship between Andre and Stella, and their mutual search for a new means of expression, reduced and minimal, is clear both in the Black Paintings and in Andre's sculptures of this period. It created the possibility of a new art, one whose aesthetic has dominated the following thirty years. The Black Paintings therefore are essential to any history of art in the second half of the twentieth century; they continue the medium and form of the great Abstract Expressionist paintings and anticipate the minimal art of the period that follows. They can provide a vital link between Willem de Kooning, Barnett Newman, Robert Smithson, Donald Judd and Eva Hesse. Alfred Barr, the director of the Museum of Modern Art, said when he first saw them that he was baffled but, "I found my eye, as it were, spellbound, held by a mystery" (W. Rubin, Frank Stella, exh. cat., Museum of Modern Art, New York, 1970, p. 44). Their coolness, the matter-of-factness of their presence and their political resonance have made them a touchstone for younger artists. Bethlehem's Hospital is one of the earlier large-scale Black Paintings. It is exemplary of not only Frank Stella's critical early oeuvre, but of Minimalism at its most poignant and developmental stage.